Efficient Cooling: All manifolds are sized to meter the flow of each circuit. The inlet port Size is the same as, or larger than, all outgoing ports combined. This maintains high flow and efficient cooling. Practical Use: You can specify model size, number, and location of all outlet and inlet ports to achieve precision flow patterns for your particular applications. 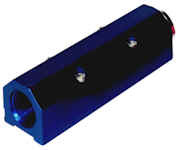 These rugged, low cost manifolds mount directly on the mold and are connected to the water lines with quick disconnect fittings. We manufacture custom manifolds to your specifications. Reduces error of water line hook-up during mold changes. Shorter hoses minimize pressure drop. The cavity next to the coolant supply line does not cool because a thermal barrier exists between the mold and manifold. Pre-plumbing allows for bench testing of pressure and flow rates. Full size porting make maximum flow rates possible. 5 sided design allows for maximum flexibility. May also be machine mounted. Standard or unlimited custom combinations are available. 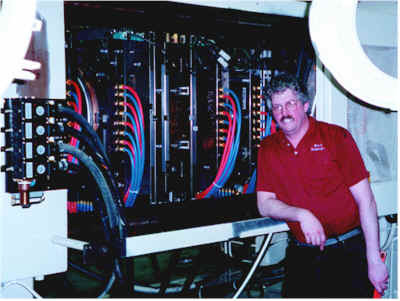 The original five sided manifold allows pre-plumbing and pre-testing of all mold circuits. Excellent for fast mold changes. 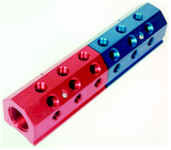 Standard manifolds are available in Blue-Supply and Red-Return. Number of Ports: Up to 8 on any one of 5 sides. Port Sizes: 1/8", 1/4", 3/8", 1/2" , 3/4" 1" and 1-1/4" with regard to supply size. 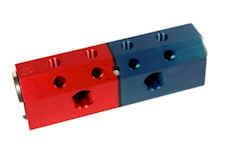 Each Blue or Red Manifold can have up to 40 ports. 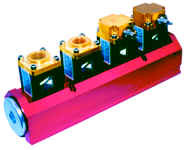 Same quality manifold as the Inline™ manifold, with the supply and return contained in one manifold. With the supply port on the side. This allows the use of the manifold where space is limited. Number of Ports: Up to 8 on any one of 4 sides. 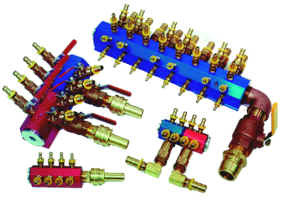 A single Sideline™ divided manifold can supply flow to a maximum of 16 inlet ports and 16 outlet ports. Mounting flush to the mold so no hoses are involved. This is an ideal manifold to incorporate into a new mold design. Available in 3/4", 1", 1-1/2" and 2" Supply. 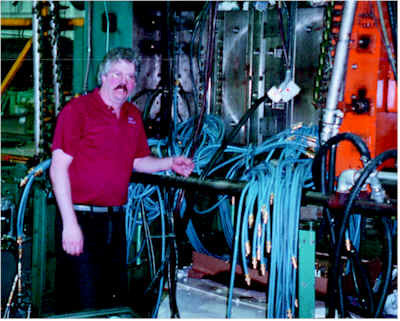 With turbine flow indicators mounted to the top of the manifold to monitor flow. For visual flow indication, or for more accurate flow reading use the Flow Readout™ hand held meter. a variety of outlet caps including valve caps can be fitted to your requirements. We stock a large variety of standard NPT threads fittings to accommodate your needs, including: Hose barbs, plugs, reducer bushings and quick connect couplings. 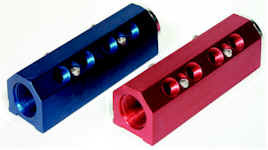 Push Lok Hose are available in1/4", 3/8", 1/2", 3/4", and 1" sizes in either Blue or Red. General Purpose Hoses are available in 1", 1-1/4", 1-1/2", and 2" sizes in either Red or Black. You want me clean up this mess? Organization is a breeze because CITO color codes their manifold and hoses. By using shorter hoses, I will eliminate clutter, reduce hose wear and minimize pressure drops. Copyright © 2016 CITO Products, Inc.